Large living room design for homes demanding better light with the use of false ceiling with use of wooden floors and special texture walls. This grand living room is all about adding style in a large space. 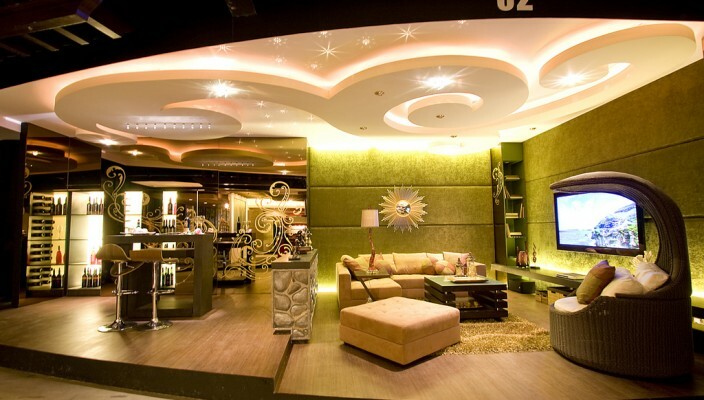 The main feature is the false ceiling that has been given ample stylish lighting to make it more like a glowing sky. A large cocoon style sofa has been added for some additional charm, while the rest of the furniture has been maintained in a simple fashion. There is an additional counter for the bar, while the floors are given a natural wooden finish to make the lighting more effective. The walls have a contrasting green shade for the perfect finish. Lights and style in a balanced mode in a living room!